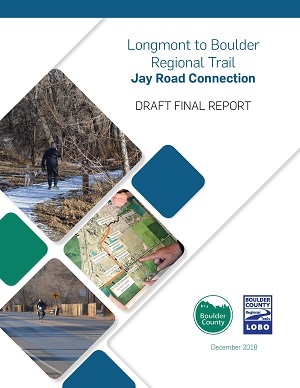 Boulder County, in partnership with the City of Boulder, is evaluating options for multi-use path connections between the Longmont-to-Boulder (LOBO) Trail at Spine Road and the Cottonwood Trail at Jay Road. Trail users currently travel on the shoulder of Jay Road and a narrow bike lane on Spine Road to make this connection. The Jay Road Connections Study will examine potential alignment options along this corridor and present a preferred off-street multi-use path alignment for future design and construction. Boulder County conducted an extensive public outreach process in March – July 2018 and is presenting a draft report that shows preferred alignments along two of the options. The next public meeting will be held in 2019. Meeting date, time, location will be posted here when finalized. April 10, 2018 – Open house to present preliminary connection alternatives and gather public input. The project will include multiple opportunities for public input. If you’d like to be added to the project notification email list for this project, send an email to the project manager.